Another easy side trip from Reggio is the town of Parma, about 15 minutes west by train. Like most of the neighboring towns of Reggio, it has the same hexagonal shape with a few ancient city portals still standing. The train stations are usually just outside these city gates and an easy walk to the historical town center. Although we drove this time, we found it easy to park near the train station and walk into town. All of these town centers are closed to cars, so if you accidentally drive in, you may receive a ticket with a hefty fine in the mail, a few (or many) months later. Parma is another attractive town with plenty of history. Sadly, it lost some wonderful heritage sites when it was bombed during WWII. A visit to the Teatro Farnese is a good way to see the damage in photographs and then see the amazing reconstruction of this wooden marvel. This beautiful theatre has been completely restored and is open to the public for viewing. 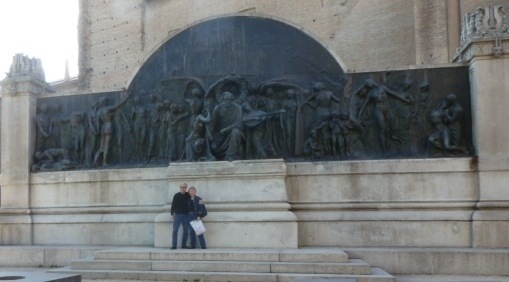 The monument to Giuseppe Verdi was also bombed—and only a small part remains in the Piazza della Pace nearby. The piazza is a wonderful space and often you will find it full of booths and activity during the special festivals they host. We wandered the beautiful centro with no agenda in mind and found ourselves at the Casa Della Musica, with the Museum of the Opera that gave us an interesting history of the development of the opera in Parma. Both Toscanini and Verdi started out in Parma, and the museum gives a good overview of their careers and how they influenced opera in Parma. This building also provides practice rooms for musicians, and a location for a music school. Across the street is a sound museum, which closed before we could get in. But, after lunch, we walked across town to the Toscanini Museum to see the house where he was born, which became a museum in 2007. It has a great collection of furniture, photos, awards and artwork that belonged to Toscanini. I was surprised to learn that Caruso, the famous opera tenor, was also quite a talented artist. I thought his sketches of Toscanini were quite good. Not far from the Toscanini Museum is a lovely park called Parco Ducale. It reminds us of Luxembourg Park in Paris, with it’s wide walkways, perfect for strolling. It’s a tranquil spot to relax or have a picnic lunch. On our way back to the center of town, we crossed Parma’s small river where we spotted a pair of pheasants. It was the perfect ending to a relaxing afternoon in Parma. Another short trip from Reggio is the delightful town of Cremona, another historical city founded by the Romans in 218 B.C. 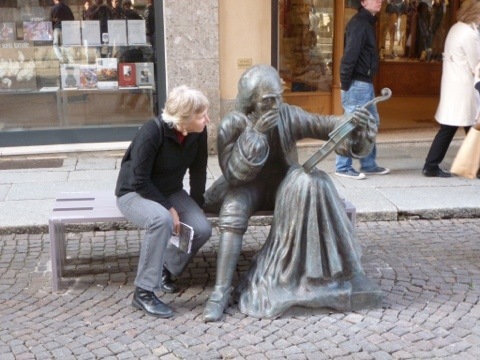 However, today Cremona is more famous for being the city where violin making began. 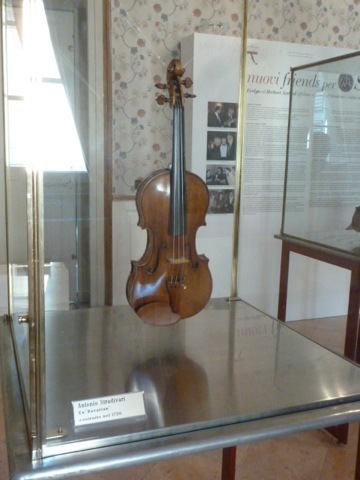 There are two museums where you can see violins by Antonio Stradivari, Giuseppe Guarneri and Nicoló Amati. We decided to visit the Civic Museum, which had both artwork and instruments. We enjoyed the 16th and 17th century artwork, especially, a striking Caravaggio, before arriving where the violins were shown. But it was really exciting for me to see the works of Stradivari and Guarneri in the same room. There were only 1,200 violins made by Stradivari, and only 600 are still around. The violins in the museum must be played regularly to maintain their quality, so there are opportunities to hear them if you make reservations in advance. But, the next best option is to watch their excellent video about the history of the violin and how violins are made. Cremona has many luthiers (violin makers) and I’m quite sure that it would be possible to see a violin being made. But our time was limited and we only had time to walk around the beautiful old town. Cremona also has some interesting Roman remains, as well as an archeological museum. It seems to be a popular town for other Italians to visit on a long weekend. It was full of families and other small groups who came to visit the museums, eat gelato and enjoy a leisurely meal at an outdoor cafe. 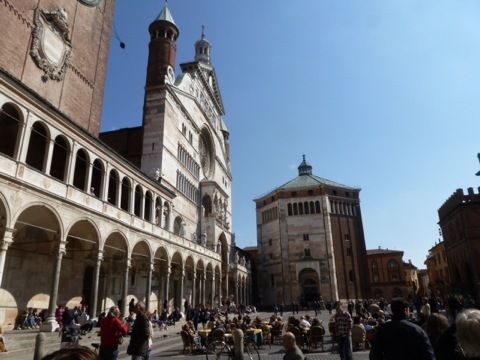 It’s yet another interesting city to explore—not far off the Via Emilia. This entry was posted in Lombardy and tagged Cremona. Bookmark the permalink. Wonderful posts, Martha! I see you sitting there next to Antonio there and wonder if the violin will be your next “language.” It’s thrilling to see you having such a wonderful time. Magari! In Italian—I wish! I’ve always loved the violin. It would be fun to learn how to play it.